Summary: A little boy becomes interested in his uncle’s day job at the soup kitchen. He observes the people around him on his walks to and from home and becomes curious about how Uncle Willie helps people. 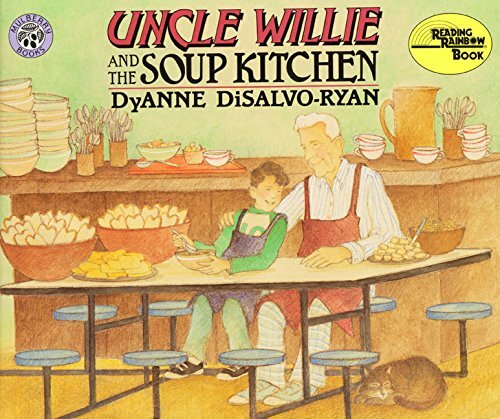 Uncle Willie volunteers his time to cook and set up the soup kitchen for all the hungry people of the community. He takes his nephew to the soup kitchen one day to help out. The little boy learns what roles the workers play, the operations, and observes the guests. At the end of the day, he feels fulfillment in helping so many people. Element 5 allows students to inform others on particular issues they have learned about. This book raises awareness of people who cannot afford to eat every meal of the day. It teaches that not everyone has to be homeless to be hungry. Through Uncle Willie and his nephew, the reader becomes aware of real life people they may see on the streets. The reader becomes aware of the operation of a soup kitchen and why soup kitchens exist. Through the characters’ words and actions, the reader realizes that some people need help and it can be a rewarding experience to help others. This will help students become aware of poverty issues and lead them into the next element of taking action to help or change the issue. Activity: I would use this book to start a discussion on poverty and the homeless. It can be read aloud to the class and the teacher can pose questions as the book goes along. The illustrations are important and fun to point out too. After a read aloud and discussion of the book, students can work in small groups to create a list of what families need in order to survive. Ideas will be shared with the class and a master list will be made. Each child will pick one item to draw and write about (why do families need this item; why is it important?). Each page will contribute to a class book about what families need. This can be incorporated in a unit about families, maybe around the holidays and around the school’s food drive. Students will be excited to help their families gather items for those who need them.